The poker community was devastated by the recent news that Nordic poker king Thor Hansen is battling with terminal cancer. The news provoked the creation of the Thor Hansen Fund which has been established to help Hansen with his medical bills. Betfair Poker is playing its part by hosting a charity tournament tonight, Feb. 9, at 9.30 p.m. (CET). The $10 + $1 event sees only $1 go towards the prize pool and $10 go directly to the fund with Betfair doubling all tournament fees collected up to $2,500. The event will feature a normal cash pay-out table, plus one player will receive a $1,400 package to a Betfair Poker Live event of their choice. The tournament features one rebuy of $1 available during the first three levels, with an optional add-on of 3,000 chips for $1 at the end of level three. Players sit down to a starting stack of 1,500 and levels are eight minutes long. 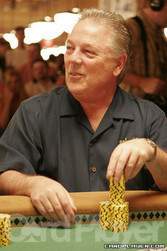 Tags: Poker Tournaments, Betfair Poker, Online Poker, Charity Tournament, Thor Hansen, Thor Hansen Fund, Cancer, Poker News.